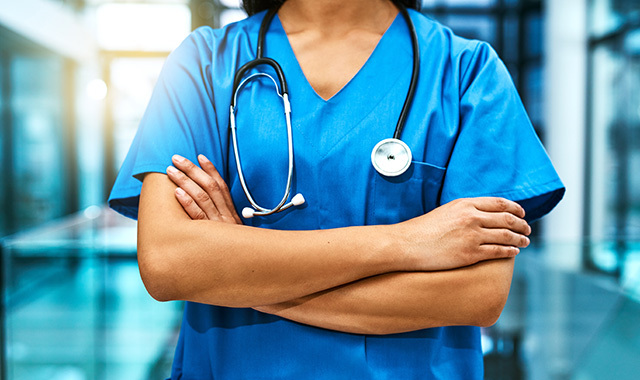 All nurses have a profound effect on their patients physically, emotionally and oftentimes spiritually, but the best nurses usually go beyond normal expectations. These nurses in the Chicagoland area have started charity events, taken exceptional care of patients with special needs, and even stayed late to help patients Skype with their family members. Step into the everyday lives of some of our region’s greatest heroes. After experiencing a head injury at age 5, Juli Aistars knew what she wanted to be when she grew up. When Aistars was an adult, she realized she specifically wanted to care for lung cancer patients. Since 2000, she’s been an advanced practice registered nurse at Northwest Community Hospital (NCH), in Arlington Heights, and she’s been a patient navigator for lung cancer since 2011. “They used to call it ‘nurse navigator,’ but we changed it because technically, we’re navigating the patient throughout treatment,” Aistars explains. Even before a patient is diagnosed, Aistars is involved. She leads patients through their lung cancer journey from start to finish, helping to coordinate CT scans, biopsies and all stages of treatment. She also checks in on patients who leave NCH cancer-free, just to make sure they’re staying healthy and not having a recurrence. Another aspect of her job is helping patients to quit smoking. Throughout the whole treatment process, Aistars’ overall goal is to help ease her patient’s anxiety. She listens, answers questions and doesn’t sugarcoat any details. Aistars especially enjoys navigating patients who are financially struggling. She doesn’t believe their insurance situation should get in the way of their care. She stands by the philosophy that, “If they live in our community, we’re responsible for them.” This passion has resulted in meetings with various hospital staff members to discuss individual patients. In 2007, Aistars’ passion for fighting lung cancer transcended her normal work hours. She started a fund through the Northwest Community Foundation to assist patients who couldn’t afford lung screenings or tools to quit smoking. Now, the NCH Lung Cancer Fund primarily aids lung cancer patients who struggle with their bills. Last year, Aistars started the “Pairing Up to Beat Lung Cancer 5K” event to help increase funding available for these patients. Since most everyone has two lungs, the concept is to “pair up and beat lung cancer” by racing with a partner. “You don’t have to run together, but your times are scored together,” Aistars explains. The event was a success, and Aistars managed to raise $2,500. But this year, she’s hoping to do even better. The next race is coming up Saturday, Nov. 3. For more information, to register, or to donate visit beatlungcancer5k.com. Even though Aistars has won numerous awards, including NCH Employee of the Year, she remains humble about her day-to-day work. To her, it’s about being a “secret weapon” for patients. Geoffrey and Kathleen Hyde have been to Centegra Hospital-McHenry a countless number of times over the past 30 years. At first, it was mostly for Kathleen’s mother. Geoffrey himself has been admitted to the emergency room for a broken arm, and Kathleen rushed in early one morning in need of a couple of stitches. It was 7:15 a.m. when the couple arrived, and Geoffrey still managed to get to work on time at 8 a.m. But the Hyde family typically winds up at the McHenry hospital for Geoffrey and Kathleen’s sons, Trace, 21, and Charley, 24. Both sons often require emergency medical attention, Geoffrey says, adding that the nurses at Centegra – now part of Northwestern Medicine – have been especially compassionate to both of them. After Geoffrey and Kathleen’s six biological children grew up and moved out, the couple decided they had room in their lives to start fostering kids. They’ve cared for nearly a dozen children over the years. Trace was 4 years old when the Hyde family took him in. He was born with trisomy 22, a rare disorder in which chromosome 22 appears three times instead of two in multiple cells. Geoffrey and Kathleen were told that Trace would never be able to talk or eat independently. The nurses at Centegra helped the Hydes a great deal in the beginning. They were the ones who taught the couple how to care for Trace at home. Around the same time, Kathleen heard about another little boy – Charley, then age 7 – whose foster parents in St. Louis were retiring. She immediately insisted on taking him in. But, after a while, Charley learned to trust the Hydes. Sometimes, not every day, he signals to them when he needs something. “That is a huge step forward,” Geoffrey says. Occasionally, Charley has seizures and needs medical attention. He’s slowly learned to trust the nurses at Centegra. Geoffrey and Kathleen say they’ve bonded with each nurse they’ve encountered. With an average of five emergency room visits per year, the Hyde family loves their “extended family” found in the Centegra staff. Thanks to a few great mentors, Jeanne Korzeniowski decided to become a registered nurse. But before that, she had many jobs in a health care setting. She started as a certified nursing assistant (CNA) at Presence Saint Joseph Hospital, in Elgin, before venturing into clerical and administration work. Though she enjoyed it, others saw greater potential in her. During her time as a registered nurse, Korzeniowski experienced some powerful moments. One such memory occurred when she was working in the catheterization laboratory, caring for an open-heart surgery patient. While reviewing the patient’s discharge papers and instructions, Korzeniowski mentioned to the patient that he might experience feelings of depression – a normal occurrence after emergent surgery. Korzeniowski has another patient who will forever stand out in her memory. This time, she was managing the medical oncology/renal unit on the third floor of the hospital, caring for a woman whose cancer prevented her from attending her daughter’s wedding. Korzeniowski’s time as a registered nurse was short-lived, however. More leadership responsibilities kept coming. While obtaining her master’s degree in nursing, Korzeniowski continued to advance in her field. Today, she’s a clinical nurse manager at Presence Saint Joseph, overseeing a staff of approximately 50 nurses and CNAs. She’s been at the hospital for 14 years. It’s no easy feat to manage 50 people and a budget. Since financial results are tied to the unit’s performance, Korzeniowski is constantly role-modeling the behavior she expects of her staff. She also researches best practices to achieve positive outcomes. When she does identify an opportunity for improvement, she goes full steam ahead. No matter what her job title, Korzeniowski’s goal has always been to make each patient’s hospital experience a good one. She’s tired when she goes home, but she feels content in knowing that she worked hard. This entry was posted on Monday, September 24th, 2018 at 12:00 pm	and is filed under Health & Fitness, Top Posts. You can follow any responses to this entry through the RSS 2.0 feed. Both comments and pings are currently closed.